Benefits of Building a Pergola with Timber Over Steel. Buying a pergola can be confusing when there are so many companies and so many options to choose from. At Australian Outdoor Living, we’ve made things easier for you! One burning question you may have is whether to choose steel or timber when building your pergola. So we’ve given a helpful pros and cons list so you can decide which material would be better for your pergola. Timber is a good option if you’re looking for something with more design capabilities – perhaps a more tailored design for your humble abode. The good thing about timber is if your kids decide to decorate it with permanent textas, it can easily be repainted and will look as good as it did the day you got it! Timber will look more rustic and add character to an more average-looking backyard. If you’re lucky enough to live at the beach, timber is more resistant to the salt and sand in the air and will therefore last longer. We hand pick our timber from local forests so we know it’s up to our high standards. You won’t have to worry about your pergola rusting or suffering from heat expansion either. Timber is also stronger and can support solar panels too. Pergolas – Timber or Steel? Steel is a modern material with excellent weather protection properties. 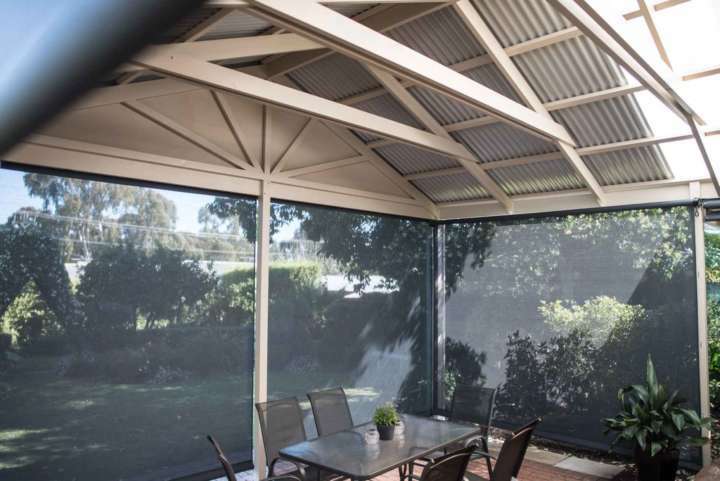 At Australian Outdoor Living we offer colourbond and Polycarb roofing options for your pergola which come in many fancy colours (Warning: so many options may cause a small domestic when deciding between colours when you see the available options)! Bondor roofing from Solarspan is thermally efficient, designed to make you as cool as a cucumber in those scorching summer temperatures. So which is friendlier to your wallet? Steel is more expensive but is generally maintenance free for the lifetime of the pergola. Ultimately, there’s no reason to fret. Most people have an instinct as to which material they prefer when they make their buying decisions. But if you’re not sure, one of our pergola experts will be more than willing to input their two-cents worth based on their own knowledge and an assessment of your property. At the end of the day, steel vs timber comes down to personal preference and stylistic symmetry for your home (not to mention who in the family can win an arm wrestle! ).